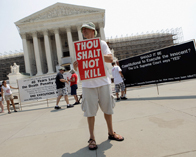 Will more states abolish capital punishment? An increasing number of states are abolishing capital punishment, and in states that retain it, fewer criminals are being sentenced to death. This year Maryland became the 18th state to ban the death penalty, and last year only nine states, led by Texas, accounted for all 43 executions nationwide. Critics argue that capital punishment does little to deter serious crime, has led to executions of innocent people and is more likely to be carried out against minority and poor criminals than white or wealthier ones. National opinion polls show that majority support for capital punishment is shrinking, though the practice retains widespread support in some states, especially among conservatives. The decline in capital punishment comes amid a general downward trend in serious crime and a renewed focus on mental health treatment for defendants accused of serious crime.